macProVideo has constantly been innovative, inventive and progressive with their training approach. They focus on delivering informative and effective content that is easy to follow. Their training has been accepted by thousands of musicians and engineers, colleges, universities, trade schools, working professionals and users just like you. macProVideo offers both training on disc and digital download, as well as website subscriptions. Find video training for Reason, Mic Techniques, Auto-Tune, FL Studio, Ableton Live, Logic, Cubase, Garageband, Pro Tools and more. SCOTT'S NOTES - Happy Holidays and Happy New Year! First and foremost, we've got some great content for you in this issue... the first part of a feature article on miking solo instruments; some informative news announcements from various music manufacturers; some cool, free downloads; a Cakewalk SONAR video; and more. Thanks so much for reading DigiFreq and I'll see you again in 2013! Now lets kick off this issue with a great feature article... Enjoy! Written by Tom Lubin - © 2010, Cengage Learning. Reprinted with Permission. Most of the time, a solo instrument should be set up in a "live" area of the studio. In a dead studio, plywood on the floor may be needed. One of the stereo microphone techniques (usually AB) should be used so that the solo steps out in front of the speakers. Needless to say, to record in stereo at least two tracks are needed, but depending on what you're attempting to achieve, you may decide to use more tracks and additional mics, particularly if you're planning a surround mix. In general, solo acoustic instruments should be miked at a distance, in order to pick up the overall sound that comes from the entire instrument. This gives the sound space. How much distance depends on the instrument and the space in which it's played. So, does that mean 6 inches or 4 feet? It's very hard to say what the best distance is for any particular instrument, and there will always be exceptions. For a particularly unique sound, a combination of close and distant miking may also be appropriate. For instance, for a "breathy" flute sound, as was associated with Jethro Tull, you'll need a close mic right near the flute player's lips, and one or two more distant mics for the overall flute texture. Many times the larger an instrument, the more likely the sound will emanate from all around it. The first step will always be to have the musician play the instrument and then move around it, listening for the place in the room where it sounds best. Be sure to add height to your movement, because the best-sounding place will often be near a reflective floor. Essentially, use your ears as a starting point and position the mics where the instrument sounds best. 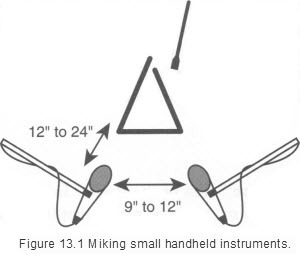 Specifically, in general (yes, I know that's a conflict of terms, but it's hard to avoid being too general while not being too specific), if the instrument is something small and not very loud, I would probably start with a pair of microphones a foot or so from the instrument, separated by 9 to 12 inches (see Figure 13.1). To reduce comb filtering, none of the distances should be equal. While the 3-to-1 rule provides the least chance for comb filtering, you may not be satisfied with the greater distance from the instrument or the wider stereo separation. A larger, louder instrument might have its mic placement 3 to 5 feet from the instrument and separated from one another by 5 or 6 feet. There are times when closer (1 to 2 feet) will sound better for the production, and other times when farther away (6 to 8 feet) is better. A 2- to 3-foot range will usually have a harder-edged pop sound, with more of the sound coming straight from the bell of the horn, the stick's contact with the drum, the attack of the strings, and so on. As the mics move away from the instrument, the sound will mellow, and the attack will blend into the sound of the surrounding reverberation. The stereo image may also work well if one of the two mics is closer to the instrument, and the other is farther away (for instance, one mic is 18 inches from the instrument, and the other is 30 inches); see Figure 13.2. Finally, always be mindful that when you have two mics in close proximity to each other, there will be comb filtering (see Chapter 4), so always check how the mics sound when they are combined to mono. DFreqDEALS - Special Holiday Sales! macProVideo Releases Art of Audio Recording: EQ Video Tutorial - Get 20% off! Drums On Demand releases Contemporary Funk & Soul Drum Loop Library - Get 10% off! Precisionsound releases Celtic Harp Sample Library for HALion, Kontakt & SoundFont - Get 10% off! Blue Cat Audio Releases Blue Cat's Oscilloscope Multi 2.0 - Get 10% off! 2) If you're using SONAR 8.5 or earlier, choose Edit > Interpolate. If you're using SONAR X1 or later, choose Process > Find/Change. This opens the Event Filter - Search dialog box. 3) Click the None button located near the bottom of the dialog box. 4) Put a check mark next to Note (the first parameter listed near the top of the dialog box). 5) Click OK to open the Event Filter - Replace dialog box. 6) To the right of the Note parameter, enter the range of velocity values you would like to use in the Velocity Min (for the lowest velocity in the range) and Max (for the highest velocity in the range) parameters. SONAR will then compress your velocity values to the range that you specified in the Velocity Min and Max parameters. 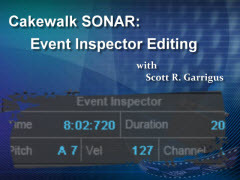 Scott Garrigus demonstrates how to edit clips, notes, and data selections using the Event Inspector in Cakewalk SONAR. Versions 8.5 (and earlier) as well as X1 (and later) are covered. In addition, some advanced tips about using modifiers with the Event Inspector are included. Copyright 2012 by Scott R. Garrigus. All Rights Reserved.